In celebration and contribution to International Women’s Day 2018 EITAN Krav Maga will be joining FEKM federation clubs across the United Kingdom, Europe and the world in specialised Krav Maga Self-Defence training events for women. All our self-defence training events for International Women’s Day 2018 will be free to all women and teenage girls to attend. Our focus will be to empower women through Krav Maga, both physically and psychologically, in a single 2 to 3-hour training session, with skills that will serve them for a lifetime. This year we are also celebrating another very important date in the United Kingdom. 100 years ago on 6th February 1918 women suffragettes, at huge personal cost, finally won the initial right to vote. In fact, one of the first ever woman martial arts instructors in the the western world was the English suffragette, Edith Margaret Williams. Edith Margaret Williams (later Garrud), a small woman of 150cm height, instructed her fellow activists in the core suffragette protection group known as “The Bodyguard” in secret locations. They trained in order to protect themselves and their suffragette leaders, such as Emmeline Pankhurst, against arrest and the brutality of the police. Williams trained them in Jiu Jitsu, the use of clubs as defensive weapons and tactics such as sabotage and subterfuge. “The Bodyguard” unit subsequently fought a number of well-publicised, hand-to-hand, combative confrontations with police officers who were attempting to arrest their leaders. And they somehow achieved this in long Victorian dresses, eight layers of petticoats and corsets. Coming back to the present, the theme of International Women’s Day 2018 is “Press For Progress”. And that’s no surprise. The Global Gender Gap Report 2017 by the World Economic Forum predicts that it will take 217 years to achieve gender equality at the current rate of change. The #MeToo campaign has also exposed the enormous scale of the threats and attacks across industries and nations that women and girls are systematically exposed to on a daily basis as they progress in their lives and careers. All our self-defence training events in the UK for International Women’s Day 2018 will be free to all women and teenage girls to attend. What a perfect time for us to share our passion for the simplicity and power of Krav Maga whilst making a huge contribution to women’s lives. All our self-defence training events in the UK for International Women’s Day 2018 will be free to all women and teenage girls to attend. Our focus will be to empower women, both physically and psychologically, in a single 2 to 3-hour training session and to open up the world of Krav Maga to women who may not otherwise imagine it is for them. International Women’s Day 2018. Empowering Women Through Krav Maga. We will have a voluntary contribution or T-Shirt purchase to raise funds for the incredible work of the “Krav Maga Women Protect” charity. We will be teaching from the syllabus of 17 FEKM techniques identified as the most important for women by “Krav Maga Women Protect” in their work with the “Red Brigade” and the women in Lucknow, India. Our focus will be to empower women, both physically and psychologically, in a single 2 to 3-hour training session and to open up the world of Krav Maga to women who may not otherwise imagine it is for them. 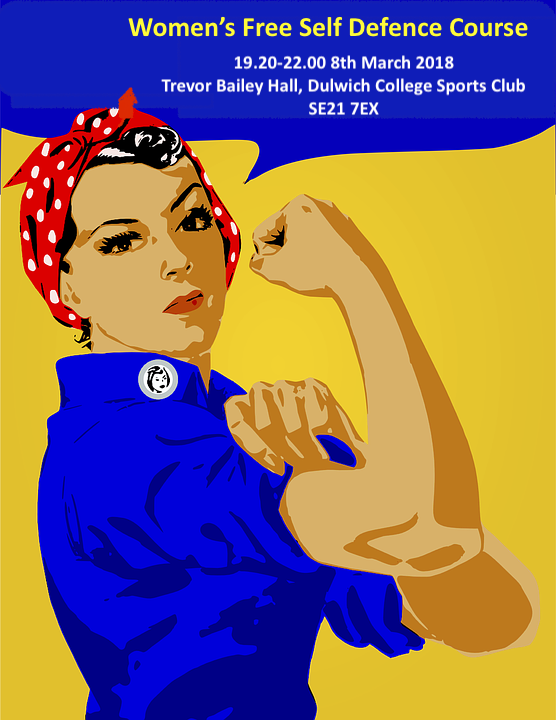 EITAN Krav Maga thanks the management and team at Dulwich College Sports Club for their generous sponsorship of our International Women’s Day 2018 event – Women’s Self-Defence Course. EITAN Krav Maga wishes all our sister clubs in the FEKM-UK and our FEKM clubs around the world hugely successful training events for International Women’s Day 2018; transformation and empowerment through Krav Maga. As we celebrate the 20th anniversary of our Krav Maga federation, the FEKM, we take a look at the role of Krav Maga today. This blog is dedicated to a very important and timely message by the founder and head of our federation Richard Douieb (Black Belt 5th Darga). This editorial piece was published in the FEKM Webzine, Issue 4, June 2017. Click here for your full copy of the FEKM Webzine. Here we are at the 20th anniversary of our Krav Maga federation, the FEKM. In 1987, I found that my work in security was lacking in interest. So, I decided to start the first training of KM in Europe. Initially, I only gave one class, then two per week. I thought that the dimension of my Krav Maga project would remain artisanal. After 3 or 4 years the first Krav Maga ‘plagiarists’ arrived. They were followed by others, and then many more. That is why, 10 years later in 1997, I decided to create the European Federation of Krav Maga. I did not want to lose this discipline which is very important to me. Today, as you know, in terms of members we are the biggest existing Krav Maga federation in the world. But our federation is not only important in terms of student numbers. It is also important in preserving the innovative principles that are the foundation of Krav Maga today. This is something which is not found in any other method of self-defence. Krav Maga is innovative and allows for continual improvement of its program, taking into account the new needs of recent years whilst also ensuring that we are not mislead “towards something else”. Finally, our federation has a duty to keep and transmit the humanist values ​​that come directly from its founder, Imi Lichtenfeld. Our federation has a duty to keep and transmit the humanist values ​​that come directly from its founder, Imi Lichtenfeld. I am well aware of the everyday difficulties of unemployment and of the world of work as I have experienced them myself, and especially those which the police are facing. I also understand that the values of our founder can ​​sometimes seem utopian. At such moments, nations are tempted to seek out authoritative and all-powerful heroes who will get them out of their difficulties. I do not decide the beliefs and position of each of you. I simply refer to what has already happened in the world in the history of mankind. In times of economic hardship, or even famine, men have often sought a strong and radical authority to get them out of their difficulties. We are in the ideal period for the rise of such extremism. What I can say without uncertainty is that this direction that people have taken for remedy, from the far end of the Caucasus to the other end of the West, has invariably led humanity to catastrophes. It is only in times when they were not buried in totalitarianism and only after such disasters and misfortune that the men and women of those times realised that it was necessary to return to greater openness. To confirm this, it is enough to look at the course of humanity since the Neolithic period. Throughout history the same causes have produced the same effects and not only in 1939-45 and during the Stalinist period. Why would it be different now? Our founder Imi Lichtenfeld carried strong humanist values. People who think differently can not rely on Imi and pretend to perpetuate his spirit. In any case, Imi’s humanist values will always be those of our federation, the FEKM. Imi’s humanist values will always be those of our federation, the FEKM. I wish an excellent 20th anniversary to all, including those who joined us well after our beginning and who continue this adventure with us. 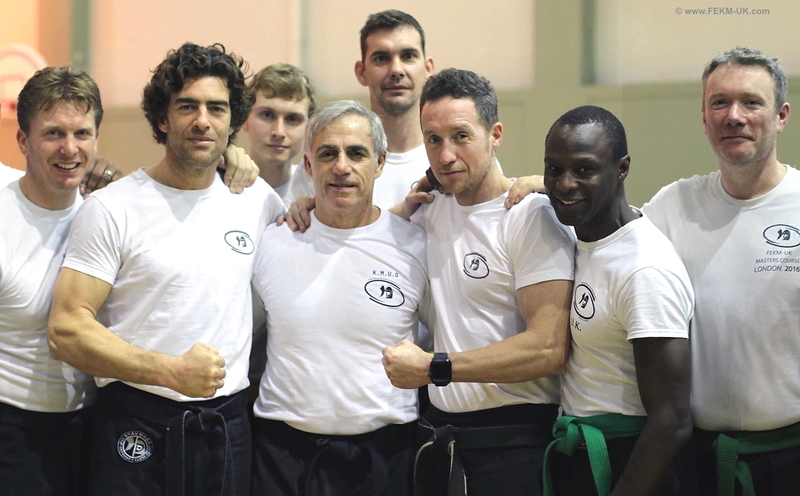 Team FEKM-UK with Richard Douieb. Winter Course 2016 Paris.